Federal investigators singled out a cause Tuesday for the collapse of tons of ceiling panels that crushed a motorist last year in Boston's problem-plagued Big Dig tunnel: the glue. The collapse could have been avoided if designers and construction crews had considered that the epoxy holding support anchors for the panels weighing 4,600-pounds each could slowly pull away in a phenomenon known as "creep," the National Transportation Safety Board concluded. "This was a failure of understanding of the phenomenon of creep," said NTSB chairman Mark V. Rosenker. When evidence of problems with the anchor system arose, engineers and others overseeing the Big Dig focused on installation problems rather than taking a hard look at the epoxy, the NTSB said. Over time, the glue deformed and fractured, allowing the ceiling support anchors to pull free, officials found. 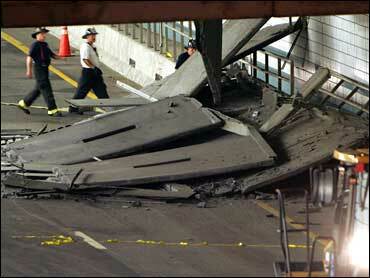 The investigation showed 20 anchors pulled out from the tunnel roof, sending about 26 tons of concrete and steel crashing down on 39-year-old Milena Del Valle's car as she and her husband drove through the Interstate 90 toward Boston's Logan Airport on July 10, 2006. The Massachusetts Turnpike Authority only inspected the anchors once, immediately after they were installed in 1999. Powers Fasteners, Inc. provided "inadequate and misleading" information about its Power-Fast epoxy, which is susceptible to creep. The company denied it was at fault. Modern Continental Construction Co. and Big Dig project manager Bechtel/Parsons Brinckerhoff failed to properly monitor known problems with the adhesive anchors. The companies say they stand behind their work. Gov. Deval Patrick said the NTSB report is a stinging rebuke for the project's past management. "It confirms the utter disappointment that I have and I think we all should have with Bechtel/Parsons Brinckerhoff, the engineering on the project and much of its leadership," he said. Massachusetts Attorney General Martha Coakley is expected to announce soon whether she'll press criminal charges in connection with the accident. A spokeswoman said Coakley would not comment on the NTSB report because of her pending investigation. Also pending is a wrongful death lawsuit filed by Del Valle's family against the Massachusetts Turnpike Authority, the agency overseeing the Big Dig, and several companies associated with design and construction of the project. "It's very difficult to re-live this tragedy," said Del Valle's 24-year-old daughter, Raquel Ibarra Mora, of Costa Rica, who attended the hearing and spoke to reporters through a translator. "It's a very rough time for me." But Mora said she was "extremely pleased" that NTSB seemed to be doing a thorough job investigating the tragedy. Bechtel/Parsons Brinckerhoff said it was reviewing the report. "NTSB has performed a thorough and objective investigation of this tragic accident," spokesman Andy Paven said in a statement. "We look forward to reviewing its final report." Modern Continental, the company that constructed the I-90 connector ceiling, used "fast-set" epoxy supplied by Powers Fasteners, Inc. to secure anchor bolts in the collapsed tunnel, investigators said. "It would be an absurd conclusion if the federal investigators were to consider Powers Fasteners in any way responsible, since the overwhelming evidence is that the fault lies elsewhere," Powers said in a statement. Modern Continental, the NTSB said, was not aware when its workers installed the adhesive anchors that the epoxy was "susceptible to creep." The company issued a statement saying: "As the NTSB report makes clear, Modern Continental fulfilled its obligations to install the suspended ceiling system in conformity with contract plans and specifications." Asked who should have known about the problem, investigators cited Gannett Fleming, Inc., the section design consultant for the connector tunnel finishes, and Bechtel/Parsons Brinckerhoff. A call to Gannett Fleming was not immediately returned Tuesday. Similar adhesive anchors are used in tunnels in New York, including the Queens Midtown Tunnel, and Virginia, but they hold lighter panels that are less than 500 pounds, NTSB investigators said. They did not cite any concerns about those tunnels. The Big Dig, the costliest highway project in U.S. history, was plagued by construction problems and multibillion-dollar cost overruns during its two decades of design and construction.